In July 1948, 27-year-old Air Force lieutenant Gail Halvorsen was flying food and supplies into West Berlin, which was blockaded by the Soviet Union. One night he encountered a group of hungry children who had gathered near the runway to watch the planes land. Halvorsen gave them two sticks of gum and promised to drop more candy for them the next day from his C-54. He said he’d rock his wings so that they could distinguish him from the other planes. Then he returned to the base and spent the night tying bundles of candy to handkerchief parachutes. Over the next three days he dropped candy to growing crowds of West German children. 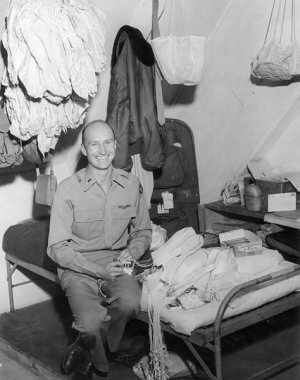 He had wanted to keep the project secret (“It seemed like something you weren’t supposed to do”), but when a newsman snapped a photograph Halvorsen began receiving boxes of candy from all over the United States, many with parachutes already attached. Halvorsen went home in February 1949, and the blockade was lifted three months later.